Defending a state championship is supposed to be one of the most arduous tasks in all of team sports. Pitfalls arise, potholes pop up, adversity appears out of nowhere in the year after a title. Every opponent is out for blood, knowing a win bring state-wide homage. The second time around, the reigning state champions are no longer the apple of everyone's eye, they're the big, bad prey that every peer wants a piece of. Southridge wasn't immune to the perils of back-to-back crowns by any means. In-state contenders such as Clackamas and Beaverton emerged, giving the Skyhawks stiff self assessments both during the regular season and playoff campaign. Ill-timed injuries occurred in the postseason, making for a few uncomfortable playoff affairs. As the Skyhawks climbed the national rankings and their play improved, the bullseye on their collective backs broadened. The challenge of winning two straight titles was both unique and exacting. But when it came down it, the nonpareil Hawks were unambiguously better than any foe put in front of them. And on Saturday, with a swaggering Benson bunch looking to take down Goliath in the Class 6A state championship game, Southridge put an exclamation point on its work, polishing off the Techsters with a tour de force defensive performance in a dominant 46-27 trouncing at the Chiles Center. "We pushed ourselves every day in practice to be our best again," Southridge senior Maggie Freeman said. "Every game was a team-wide effort. We really came together as a team, played our hearts out and did what we know we can do. We leave behind a legacy that's hard to beat and will be hard to forget about, honestly. I'll never forget about this team." "They trust each other and you don't see that panic in their eyes, which is amazing," Southridge head coach Michael Bergmann said. "They never doubt. And when they needed to bring it up a notch, they always did." 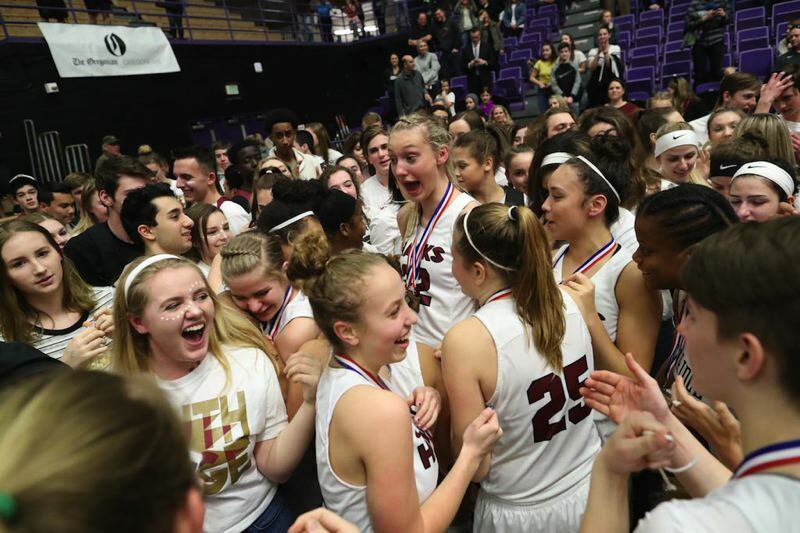 Southridge was the prohibitive favorite to win state again from the second the final buzzer sounded in the 2017 state championship game. The pressure to repeat stuck with Southridge for 365 days. The onus to get another title was intense, especially as every pundit and scribe penned in the Hawks as shoe-ins to double dip. "The girls kept working because it's a bit of grind when you hear how great you are and if you have one bad game everyone's disappointed," Bergmann said. "They did a great job of fighting through that, playing for each other and getting through the lull of the middle of the season when you might win by 30, but you might not play well. It's hard to hear from me about how you have to keep getting better. But they stuck together and I saw them kind of come together and get joy from each other. The back-to-back means the most because of that. It's hard to keep that grind." The Skyhawks handled the difficulty in rather authoritative fashion, with graceful ease. "We're such a strong team that stuck together through the downs and the ups," Southridge senior Natalie Hoff said. "In this tournament, there were times where other teams went on runs and we could've given up, but we didn't. We never did. It was really important for us to go in knowing we were going to see our opponent's best game. We just had to play our best game and we did that today." Southridge held Benson to just 19 percent shooting from the floor and limited the Techsters to a single field goal in the first quarter (1-for-16 from the floor). The Skyhawk 2-3 zone teemed around the Techsters like a well-trained school of piranhas, arms extended, eyes both on the ball and the player nearest to their assigned area, hands tracing the rock, passing lanes shrouded by lengthy limbs. Freeman, Natalie Hoff and Cameron Brink buttoned the back half of the defense, providing rim protection and flanking help on the outskirts of the perimeter. Maya Hoff and McKelle Meek, both of whom had breakout postseasons individually, manned the top of the zone with meticulous positioning and fast feet. Connected by constant communication and keyed-in knowledge of Benson's shooters, Southridge set the tone early defensively. "It's a championship game and you have to throw your heart out there and leave everything on the court," Freeman said. "Defense has been our strength and on offense, we just do what we know how to do. That's what wins games and holding them to 27 shows what kind of game we play." "We wanted to come out with a lot of energy on defense," Natalie Hoff said. "We had a lot of drive this game, we really wanted this one." On offense, the Skyhawks' aggression was paramount. Benson superstar junior Tayler Lyday picked up two fouls in the first quarter trying to stick with Freeman and Maya Hoff off the dribble. Southridge settled in, getting points from all five of their starters to open up a 15-5 lead at the end of one. Meek's three off a kick-out pass from Maya Hoff gave Southridge its first double-digit lead of the game. Brink buried a jumper and later took a rebound coast-to-coast for two. The Skyhawks led by 19 twice in the second quarter thanks to an NBA-range three and a high-lofting floater from Freeman, an acrobatic steal-and-score from Natalie Hoff and a putback from Brink. At the half, Southridge was in firm control, leading 28-11. "Every game we got better at sharing the ball and playing together," Bergmann said. "We wanted to find and get a great shot. I thought our girls did a good job of not forcing anything. With us, you can take our away posts, but then you have to worry about our guards with no help, so it's pretty tough." Benson meanwhile was in an utter bind on offense and without Lyday on the floor as the runner-up's nadir, the Techsters were rudderless against Southridge's broadened, intertwined defensive enigma. Benson's shots sprayed off the rim and brazenly thumped the backboard as the Skyhawks contested high and hard on the perimeter heaves and held their ground in the paint. Nothing easy, nothing given. In the first half, Southridge yielded just four field goals to Benson. "I think they were a little shaken up," Freeman said. "We wanted to keep the ball out of (Lyday's) hands, make her do things she didn't want to do. Defense should be everybody's focus. No matter how good you are on offense, you should always be a strong defensive team." For all the hoopla about the Skyhawks' arsenal of offensive options, Southridge's two-year run atop 6A has been defined by dogged defense. "We tell the girls if they sprint everywhere, they're really hard to score on," Bergmann said. "The talking is an area they've really grown in. At the beginning of the year, I didn't think they were doing a very good job of communicating that well. We have a lot of nice kids who are really kind of quiet. But they came out of their shells as the year went on and sacrificed for each other." The Hawks' defense was so good, Southridge only scored six points in the third quarter, yet led 34-17 at the end of three. Maya Hoff continued to play magnificent basketball in the second half, making two threes while dishing out two second-half assists, both of which set up three-pointers for Freeman and Meek. Maya Hoff scored in double figures in each of the 6A state tournament games including 10 against Benson. "She was great," Bergmann said of Maya Hoff. "She hurt her ankle and she just kept fighting through it. She did a great of taking the ball in her hands and just attacking their pressure." Southridge took on all comers, finishing the season 28-1 overall with a 26-0 mark against Oregon teams. The only loss Southridge suffered was to Centennial (NV) back in December. The Hawks housed every in-state team by double digits. Defensively, Southridge had no equal. They held each state tournament foe to 33 percent shooting overall. Canby, perhaps the only playoff team that tested Southridge, was the only squad to hang 50 points on the Hawks. Surely, Beaverton had moments of high-quality play against the Hawks and Clackamas took Southridge into the fourth quarter of the 6A quarterfinals before fading. But, Southridge had little hinderance when it came to sweeping the state field away. Their talent level was bottomless, their team chemistry soundproof. Perhaps what made Southridge most dangerous wasn't that they had one centerpiece, but three. Brink, Freeman and Natalie Hoff could be the main option on any team in the state. Some would argue that trio is the top three players in Oregon, regardless of class or classification. Freeman was the best knockdown shooter in the land, a feared, yet revered marksman whose game became more complete over the past two years. 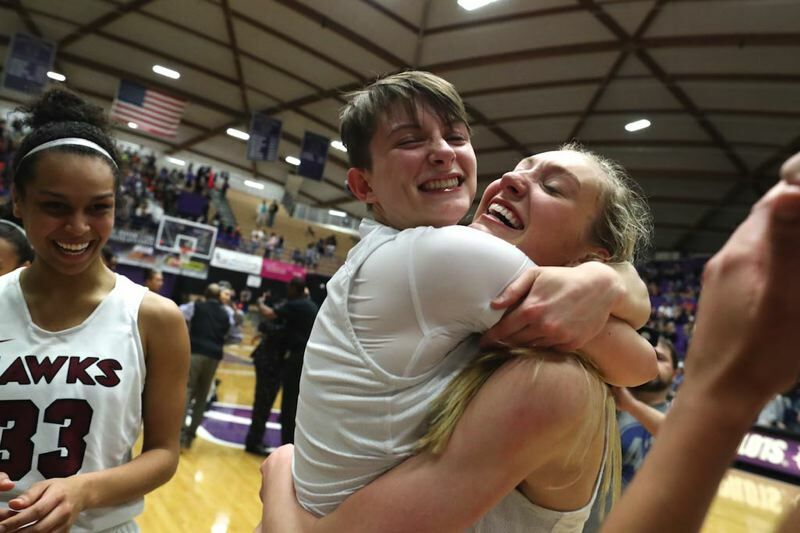 She moved to Beaverton from Medford two years ago seeking more exposure for herself as a collegiate prospect and to see if she could be a part of something bigger than herself. The lefty achieved both. Brink is the human cheat code, somebody so tall, spry and skilled that she can take an opponent's will. Brink and Freeman were co-Metro Players of the Year. Natalie Hoff was no third wheel. Her versatile skill set, balletic footwork, stunning defensive instincts and distinct leadership qualities made her into an all-state quality player who carried Southridge past Canby in the second round. Then you add in the astounding promise of Meek and Maya Hoff, both of whom seemed to make giant leaps in improvement by the game, and the invaluable contributions of Kaylen Blair, Emoney Reid and Kyla Vinson throughout the year and it's no wonder why Southridge was being talked about as one of the best teams in state history. With Brink, Meek, Blair, Reid, Vinson and Maya Hoff coming back next year, Southridge should very well be in the hunt for three consecutive crowns. Brink finished with 10 points, 9 rebounds and 6 blocks against Benson. Natalie Hoff had 6 points and 9 boards. Freeman had a game-high 12, Maya Hoff added 10 points, 4 boards and 2 assists. Meek had 6 points, 6 boards a team-high 3 assists.